About 5 years ago at an instructors' caucus, the instructors in attendance agreed that having a DPE in our own club would be a huge asset. We went around the room. "Do you want to do it? " No. "You?" No. "How about you?" No. Well, Piet is the only one gullible enough to do this. I barely scraped in with the number of flight instruction hours (200). 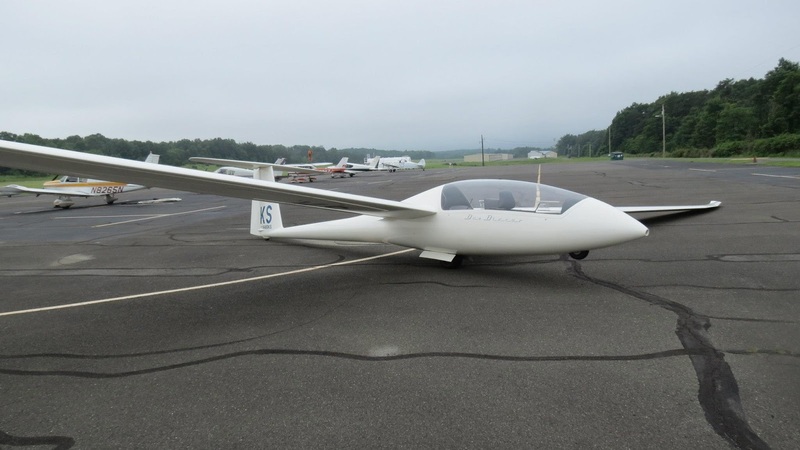 I immediately sent off my 8710-10 form to the National Examiner Board (NEB), and promptly got a response from the NEB stating that I was qualified to be a glider DPE-CE (allowed to do check rides for up to commercial pilot level). The application with the NEB lasts for only two years, then I had to re-apply. 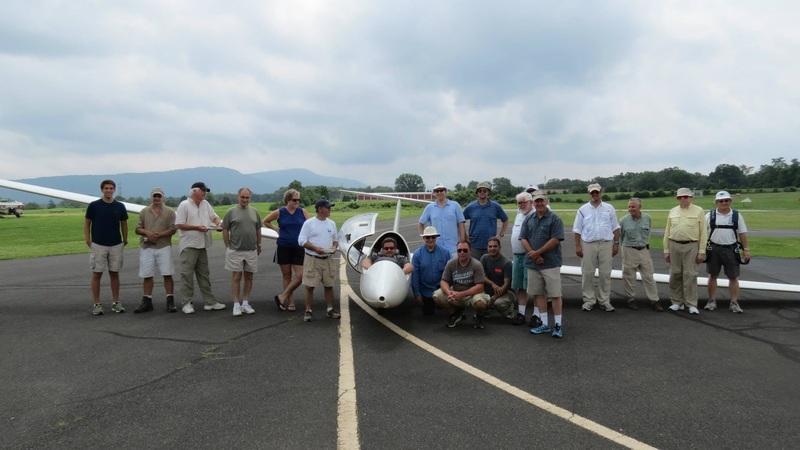 After several years of the FSDO ignoring my application, I finally got them to agree to get me through the system and anoint me as the only glider-capable designated pilot examiner in the Washington Dulles FSDO region. The FSDO agreed to allow me to begin the DPE training courses offered by the FAA. November 2014: I immediately enrolled in the FAA's online course for the initial Designated Pilot Examiner training session. This consisted of several different voice actors reading off what essentially looked like powerpoint slides. The slides were for all DPEs, not just glider DPEs. 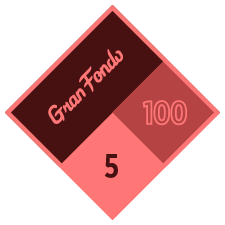 The content spanned the whole range of FAA rating levels, from the sport pilot all the way to multi engine ATP ratings. As you can expect, only a small portion of the course content mentioned gliders, usually only when discussing the need for medical certificates for everything. Except for gliders. 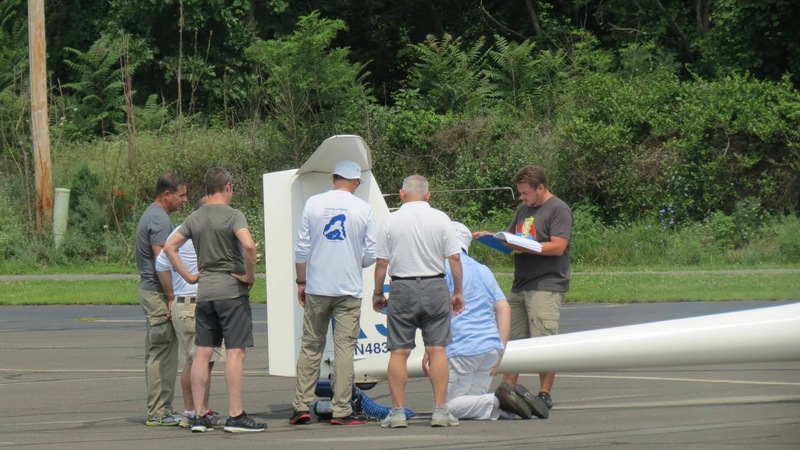 The course concluded with an open-book test of 25 or 50 questions (I don't remember which), asking questions for all sorts of scenarios imaginable, none of when applying to gliders. But I guess that's not surprising to you, either. After completing the online portion of the training, I looked to sign up for the week-long training session in Oklahoma City. The only class was listed in January. It was already fully-booked. I attempted to sign up for the March class, but its registration was not yet open. Around January, I signed up for the training, and was put on stand-by, while the FAA waited for enough candidates to enroll. In the middle of March, I flew down to Oklahoma City to attend the week long training session. The course was attended by 17 other candidates to become DPEs as well. But as you can expect, I was the only glider guy there. I was also the only pilot there who has never been a professional pilot. 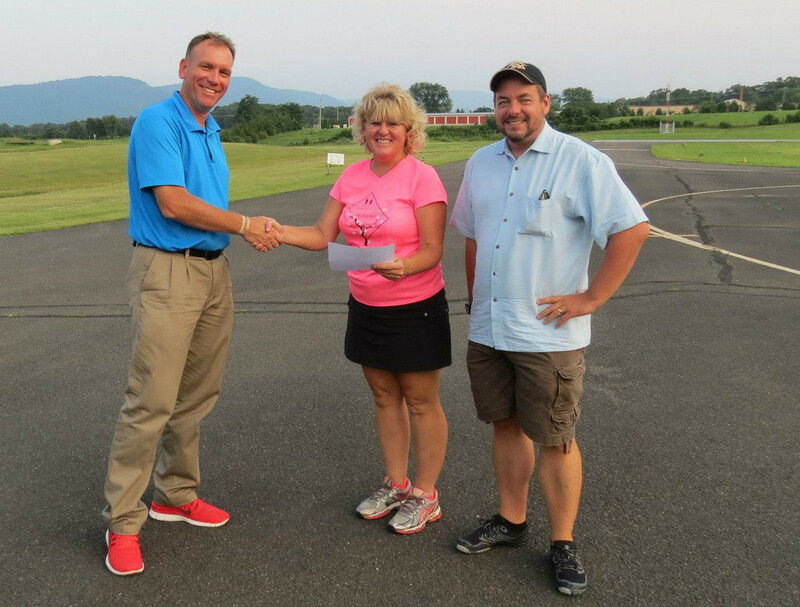 There were airline pilots, cargo pilots, helicopter school owners, and even sport pilot instructors. I was the only person in the room who didn't have a medical certification to fly. The first day of class focused on all areas of part 61, ratings applications, and as you would expect, focused much of its time on the matters that don't concern us glider pilots. The second day talked about writing a plan of action, how to submit the 8710 document correctly, without having the office in Oklahoma City reject your paperwork. We also spent a fair amount of time learning about the computerized system that intends on replacing the 8710-1 application; IACRA. The third and fourth days were divided into workshops, where we would do mock ground portions of the practical test. My partner was a UPS pilot. Had never seen a glider up-close before. I did a mock practical test with him, where I was taking the private pilot ASEL. 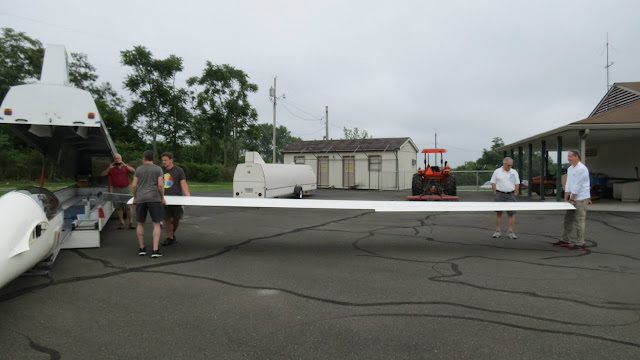 I passed the ground portion pretty well, but the FAA people threw in the scenario that I botched the short field takeoff portion of the practical test. My partner practiced by writing me a notice of disapproval. No hard feelings. It's just a mock practical test, after all. When it was my turn to play examiner, he was doing a commercial add on for glider. 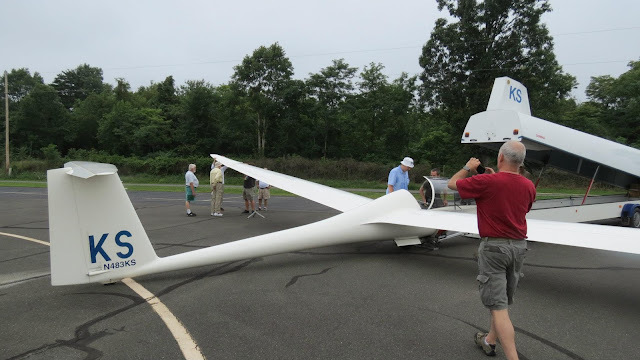 You might think that a long career in aviation could prepare you pretty well for answering questions about gliders, but when it came time to answer the question "What is a variometer?" He tried to buffalo me. "It's... an... instrument that measures things... that... vary" The word 'variometer' is explicitly stated on the Practical Test Standard. There's no way to weasel out of this one, and that wasn't an acceptable answer. So I also got the opportunity to practice writing a notice of disapproval. No hard feelings. It's just a mock practical test, after all. My long journey to become a DPE isn't over. I still have to get some sort of paperwork approved by the local FSDO, I have to get issued all of the paper forms I'm going to need for when we don't have an electronic submission of paperwork, and I'm going to need a visit from an examiner-examiner, to make sure I indeed know how to fly a glider. Maybe by sometime in May or June I can finally start administering practical tests. 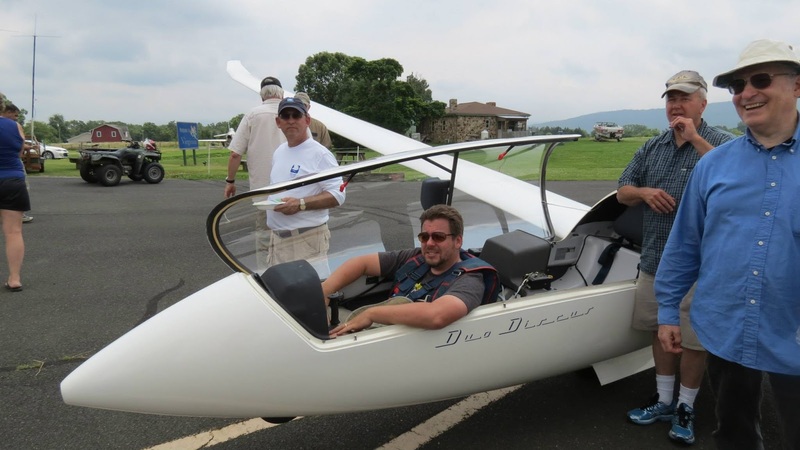 I tried a long-distance flight in my glider. It was forecast to be a glorious day, and it turned out to be every bit as great as it was predicted. Shane called me the night before, trying to gauge whether or not we would have enough people around to get a tow pilot ready for an early day of towing. I agreed to show up an an ungodly hour of 0630. I managed to get to the field at 0650 that morning. "You're late!" Shane responded. 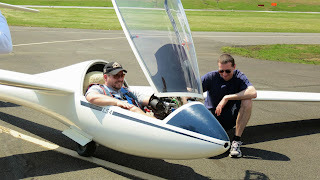 I assembled the glider quickly, but started having some difficulties programming the task into the flight computer. I've recently had many difficulties in programming the combination of LX-Nano and ILEC SN-10B. The fact is mostly complicated by the matter that I don't have an MS-Windows laptop that runs the software needed to do the programming. I solved this problem buy buying a Microsoft Surface Pro 3 the day before. I'm extremely pleased with the purchase so far. This a pretty huge endorsement considering that I used to have a bumper sticker that read "Microsoft must die!" However, whenever a new computer is purchased, at least 3 or 4 days of tinkering is required -- installing all of the necessary software, drivers, and apps to get a computer running. Despite the cool features like a touch screen and pen, this one was no different. Unfortunately, I didn't realize that some of the software necessary to run the configuration program for the LX-Nano required a long download of some required some drivers off the Internet. This download took a while to complete, while Shane was off flying in the good morning air. Shane launched at 08:20, and I didn't get all of my computer issues sorted until after the morning safety briefing. 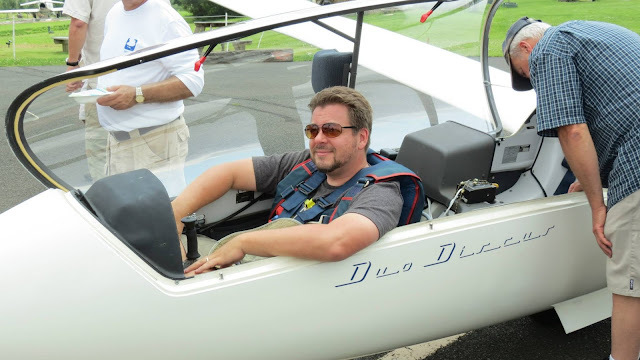 I elected to sit in the glider during the safety briefing. Even during the briefing, I was still trying to remember how to upload the waypoints into the SN-10B. 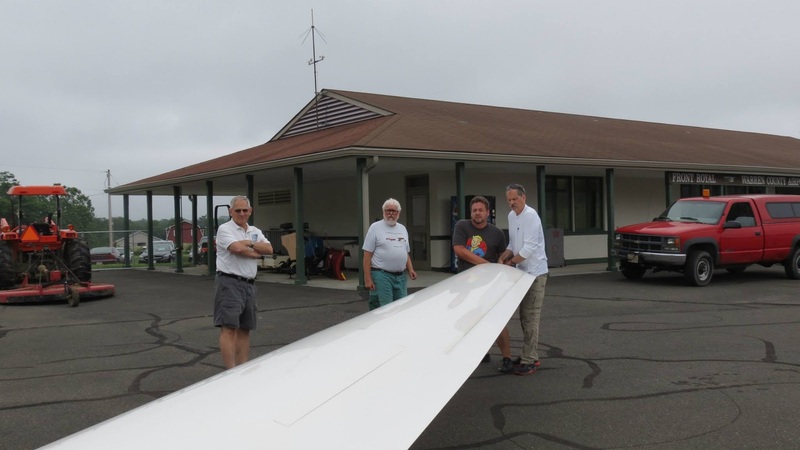 Here you can see Bill Burner, my towpilot, installing the USB device that I used to upload the waypoints. I'm sitting during the morning safety briefing, and still trying to get the flight computer issues sorted out. I soon discovered that the USB Upload didn't upload my waypoints, for whatever reason, and I was therefore unable to program my southernmost turnpoint and northernmost turnpoints into the flight computer. It became clear to me that I was going to have to do this the old-fashioned way: with a paper sectional, eyeballs, dead reckoning and orienteering. With all the stuff I've got in there, there's not much room for me! All of these way points are in the Shenandoah valley, with the exception of Thornton Gap, which is actually nestled in the Blue Ridge mountains. My start point is Front Royal airport, and then I travel down the blue ridge to a point south of Buena Vista, VA, The turn point is just a mile or so from where the Maury and James Rivers converge, in a little town called Glasgow, VA. Immediately after launch, I went toward Skyline drive, where I found a strong thermal, and climbed up to 500 feet or so below the clouds. I briefly spoke with Shane, who had already established himself in the wave lift, climbed to 13,700 feet. Within a few minutes, I had already established myself in the wave, and easily climbed above the clouds, rapidly climbing to 10,000 feet. What a great way to get started on my task! At this altitude, the winds were around 45 knots out of the Northwest. I turned southwest, with just enough crab angle, just enough speed, and just enough southerly heading to get on my way to Glasgow, without getting blown downwind. 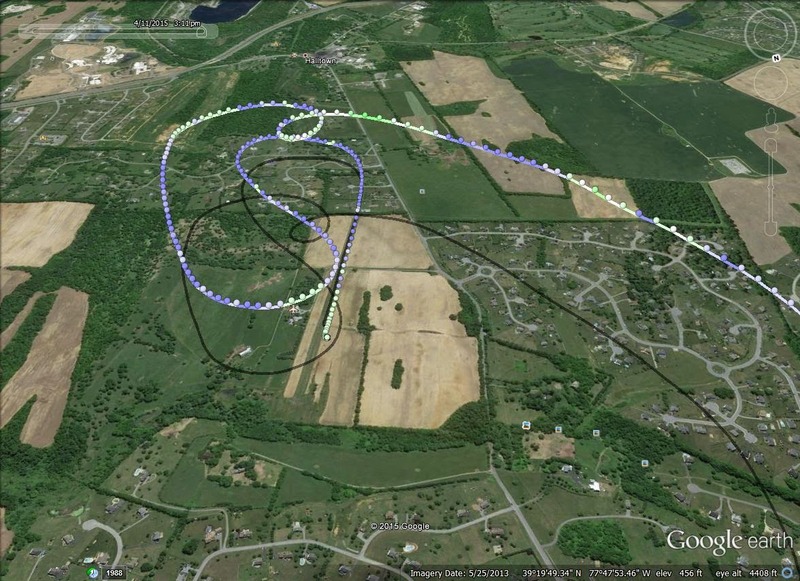 As you can see from this GPS track of my flight, the bed spring pattern in the bottom right is where I was turning in a thermal, getting blown downwind by the strong Northwesterly winds. I connected with the wave in the top right portion of this picture, and was on my way to the South, in the upper right corner of this picture. 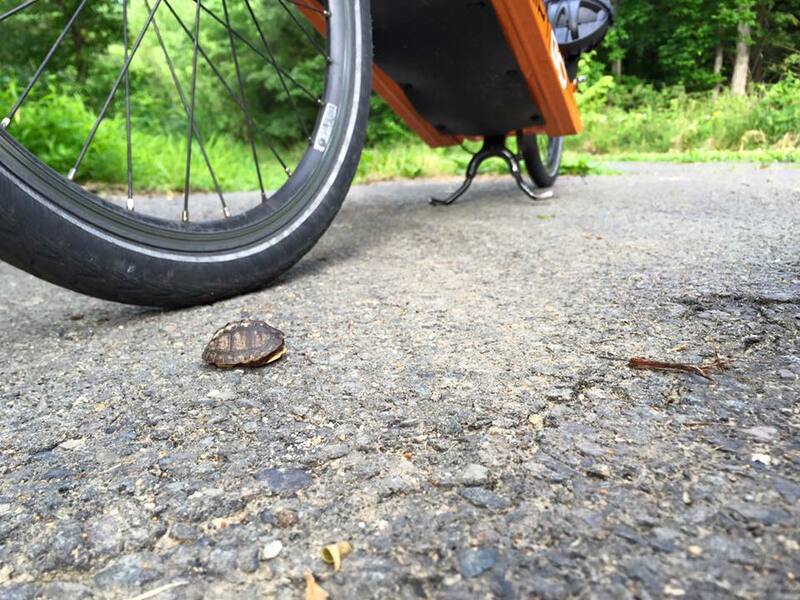 I set out on course, making small adjustments to stay in the wave. 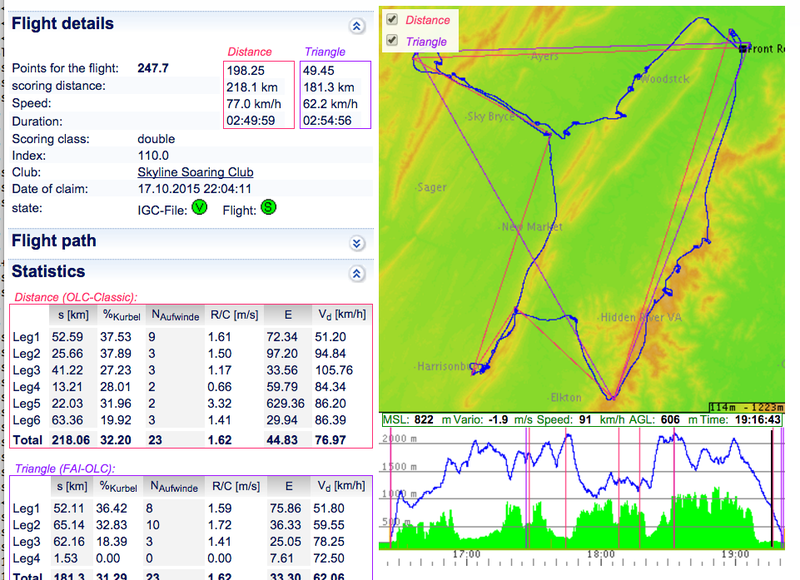 For the most part, I was able to stay at around 10,000 feet, with a southerly ground track. The best part about travelling in wave is that it's such a fantastically smooth flight. In the wave, on my way at 10,000 feet. You couldn't get a smoother flight in the hangar! The city of Waynesboro is just a bit past the halfway point on my southern leg. By the time I got to Waynesboro, I was still in the wave, but it was getting weaker, and I was no longer able to maintain flight in the wave. I descended to about 6000 feet, and the super smooth air turned into bouncy turbulence of thermals. It was still too early for the thermals to be well structured, so I headed straight for the mountains and started making use of the orographic lift coming off Cellar Mountain. 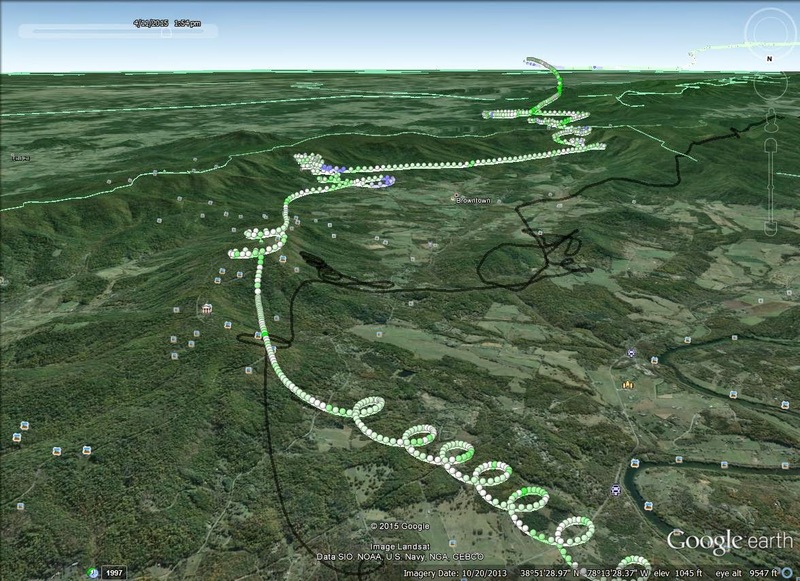 I bopped along the mountains, flew past Buena Vista, VA, and got to Glasgow, VA. Since I couldn't properly program my SN-10 with these waypoints, I wasn't exactly sure where my southern turnpoint was. I knew that the radar domes south of Glasgow were well beyond my turnpoint, so I just headed there. It's better to go a bit beyond the turnpoint and not need it, rather than to turn before the waypoint. Apple Orchard mountain is a great way point, and in retrospect, I should have chosen that one instead of Twin River airport. Since I was down that way, and I wanted to make absolutely sure that I had passed the waypoint, I flew up to the radar dome to get a closer look. In case you never get to drive that far south, the Apple Orchard Mountain has the highest point on the Blue Ridge drive, about 4160 feet above sea level. It has a few scenic overlooks nearby that look like they have a spectacular view if you drive up there. Having gone as far south as I could on this flight, I turned around and headed back north, toward Harper's Ferry. The way north was also easy, I just bopped along the ridges, occasionally turning in very strong lift, which was also very tight. The only way to circle in the lift on this mostly blue day was to bank at 45-60 degrees of bank. I looked at my watch, and realized that the day was going faster than my flying was. 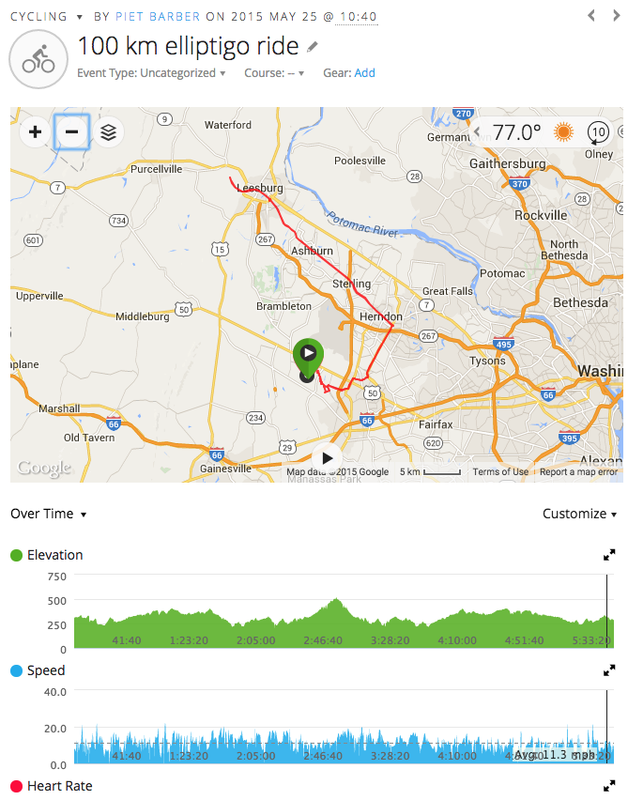 I also realized that I might make more time if I diverted to the Massanutten mountain range, and did high-speed ridge soaring along the way. 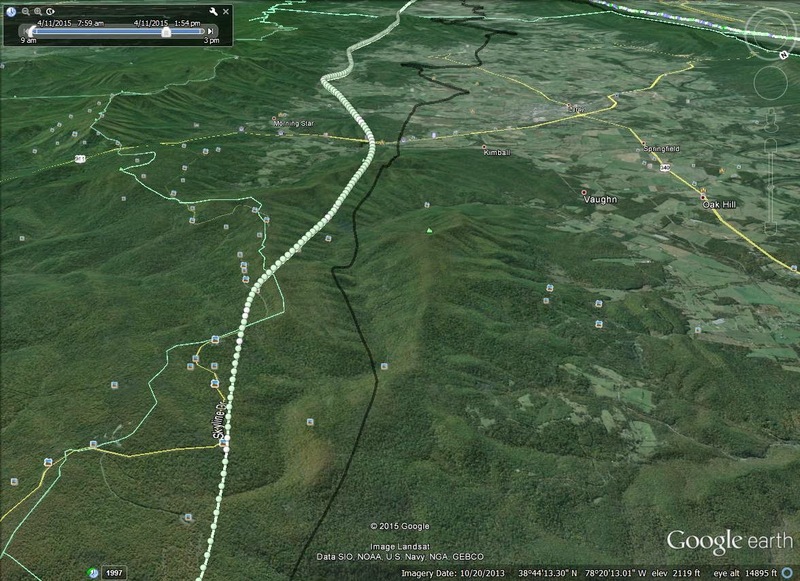 I diverted south of Lynwood, and went directly to the Massanutten Ski Resort. I smoked along the ridge at about 90 knots, getting huge blasts of lift along the way. It took me less than 25 minutes to get to Woodstock, where I gained some altitude in the strongest thermal of the day. I got distracted for a few minutes while I was taking a pee break. I checked in on the radio with home base at Front Royal, and headed off to Harper Ferry. When I uploaded the waypoints in my computer before launch, unfortunately, the airspace files stopped carrying the information about the Class B airspace centered around Washington Dulles International Airport. 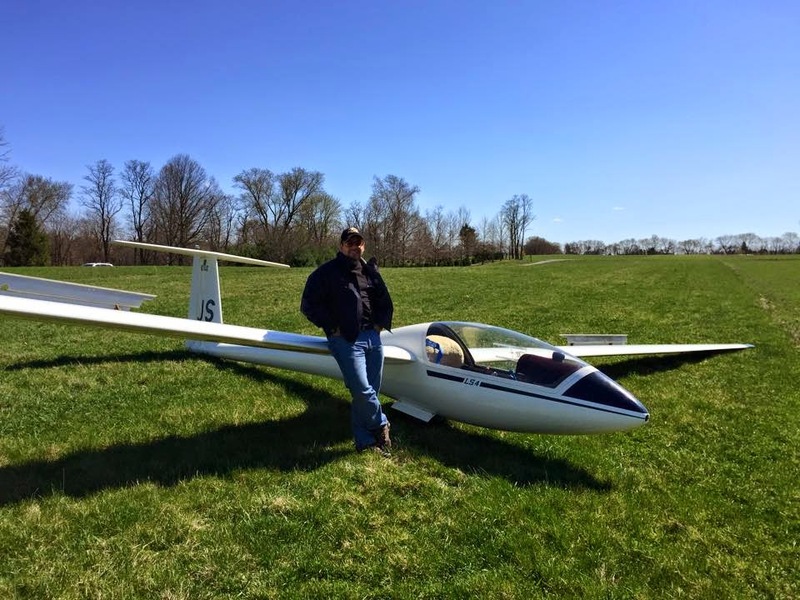 I understood that so long as I stayed on the western side of the Blue Ridge mountains, I would stay out of the Class B airspace. Unfortunately, some of the good cloud markers were drifting east of the mountains. Without the flight computer displaying exactly where the airspace boundary is is not as exact as I would have liked. I bopped along the Blue Ridge mountains north of Front Royal, which are much less spectacular than south of Front Royal. They have sort of a half-pipe appearance, but still generated adequate lift. I just bopped along, with only occasional circling. My next turnpoint is a little airport not on the aviation sectionals called "Needwood Farm" airport. If you didn't know it was there, you'd never find it. I looked around for it, but had to leave the safety of the lift on the mountains to find it. There were many magnificent fields to land in. As I fly, I'm always looking at fields, to use as an escape route. I never fly over terrain that has no escape route or suitable landing field. In this case, there were so many fields, I could hardly choose among all of them! And also, I had a hard time telling which field exactly was the one I needed to fly past. I finally saw a field with a wind sock, and identified the field as my turnpoint. But by that time, I had descended so low that I couldn't possibly make it back to the ridge with a safe enough altitude margin to spare. All I could find in this area was serious downdrafts, and occasional bursts on the variometer saying there was lift. But I decided that those short bursts of lift were too small and too weak to me to effectively exploit. I make an uneventful landing at the field with the windsock (This has to be an airport, right?!). 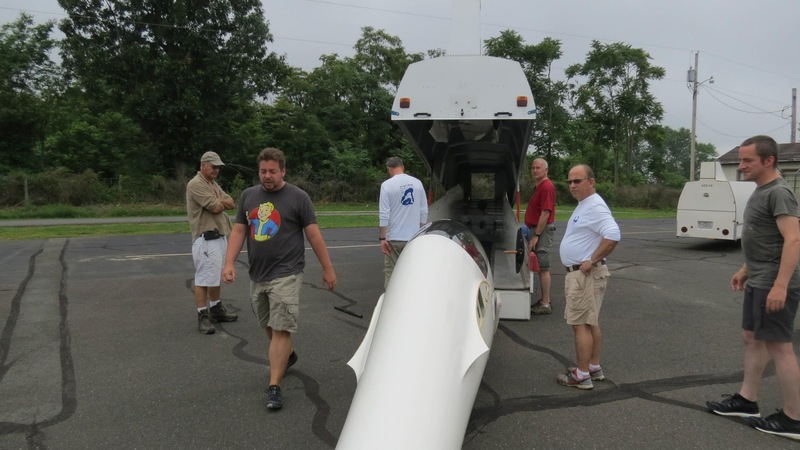 At the end of the landing roll-out, I kicked left rudder to weather-vane the glider to point directly into the wind. I get out, stretch my legs, pull out the phone and start calling around to people back at Front Royal. A concerned neighbor named Rhonda drives up, "Are you OK!? I saw your plane land in this field!" 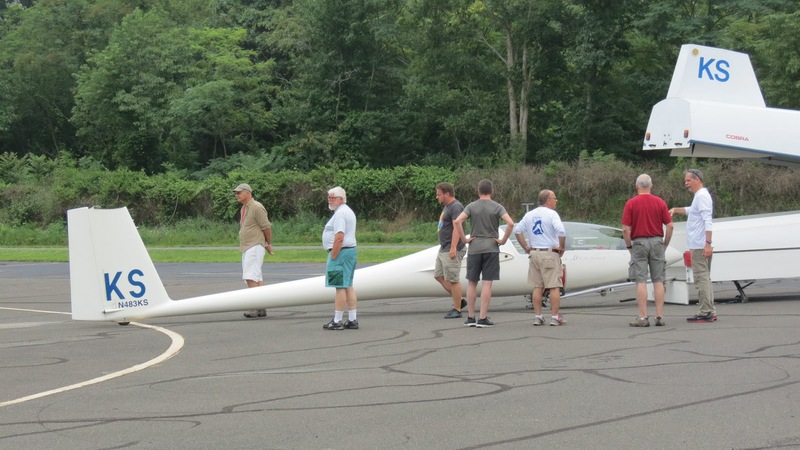 She had never seen a glider before, and never seen one up close. "weren't you scared!?" I convinced her not to call the fire department, rescue squad, or police. She took this nice picture of me, waiting for my crew to show up. I couldn't find the owner of the house right next door, I figured they were out shopping or something. I sat by the glider for an hour before my crew showed up with the trailer. The owner finally came out about 10 minutes before the crew arrived, and we had a nice conversation. He was quite friendly. 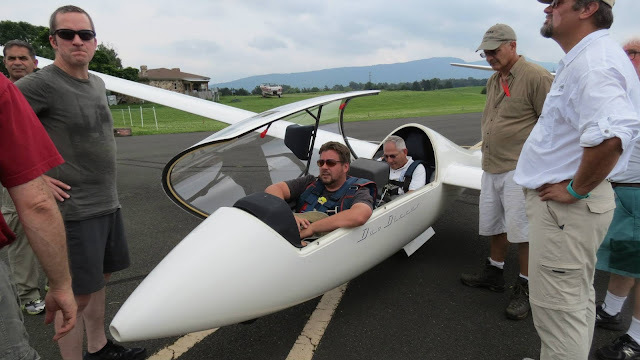 He brought out his granddaughter, 8 years old, to get a seat in the glider. The disassembly and ride home were uneventful. 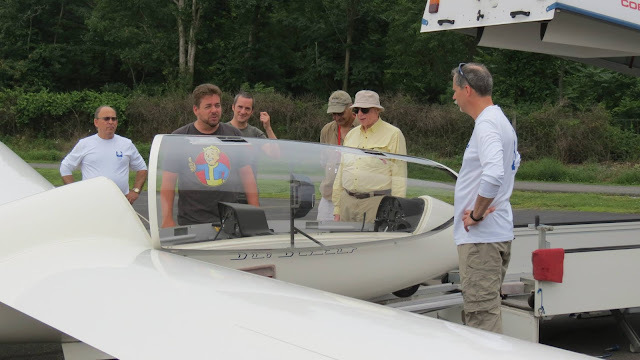 I uploaded my flight to OLC, and was dwarfed by some other utterly magnificent flights on that Saturday. 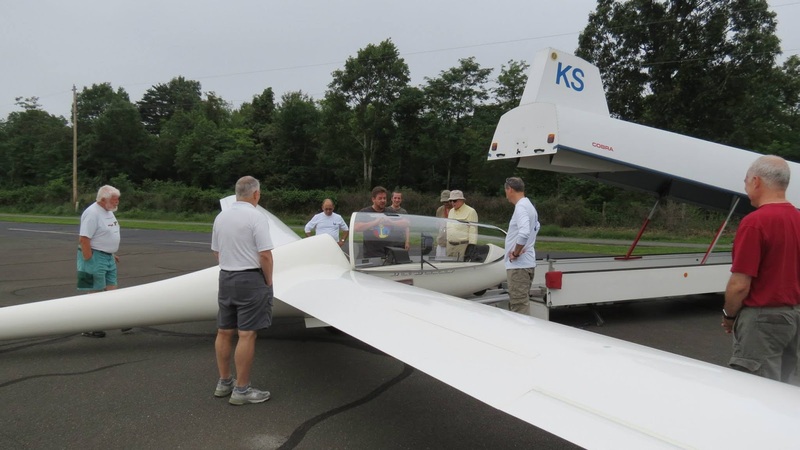 A German pilot recently moved to the US (Karsten Petzold), and took a 900 km flight over 8 and a half hours in his motor glider [OLC]. Shane ended up having an 8 hour flight, going up to Ridge Soaring in Pennsylvania and back [OLC]. 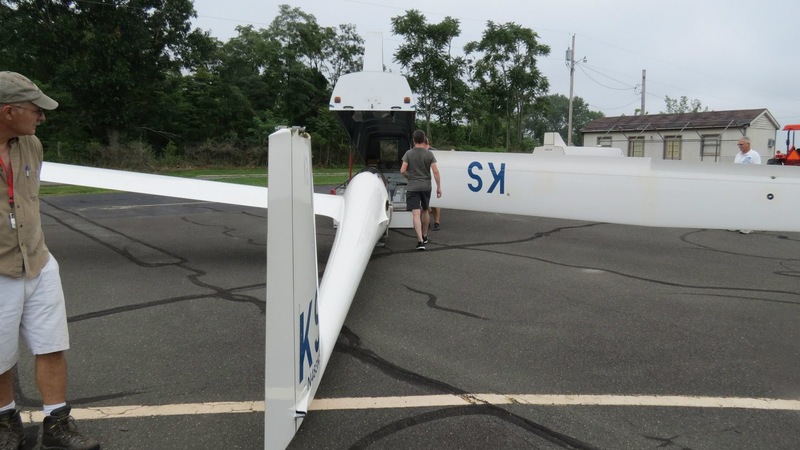 This young guy (Daniel Sazhin) took off from Blairstown, New Jersey, set out on a series of ridges and landed out more than 783 kilometers in a field 40 miles west of my land-out [OLC]. The most impressive part of this flight was that he did this magnificent flight in a klunky old SGS 1-26! Maybe I need to spend the night in a hotel, so I can get a guaranteed good night's sleep, away from the distractions of home at dinner time. It's really hard to get a good night's sleep the night before an epic flight like this. I have to really try to get my mind off of soaring, so I can clear my thoughts and fall asleep. Taking a sleep aid wouldn't be legal. Now that I have a Windows laptop, I'll spend some time getting the waypoint files correct for the SN-10. I really need to spend a rainy day at the field, making sure I've got all of the procedures for uploading the task into my SN-10 appropriately. I'll have both a Washington and a Cincinnati sectional, so I can have the whole route covered. (the last few miles of my trip weren't on the Cincinnati sectional). Choose more obvious waypoints, like one that's on top of a mountain. Not just some field among zillions of other fields. This way, if the GPS does fail, at least I can navigate my way to the obvious waypoint with the old fashioned methods. 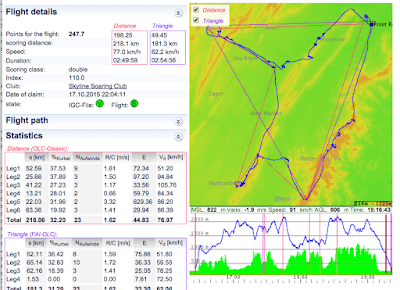 On days with ridge soaring tasks, choose waypoints that are ON the ridge, not AWAY from the ridge. The reason I landed out is because I left the safety of the mountains, and into the valley, where there wasn't much going on besides sink. I should take some ACTUAL pictures in-flight, instead of thinking you'd be satisfied with Google Earth GPS representations of my flight.